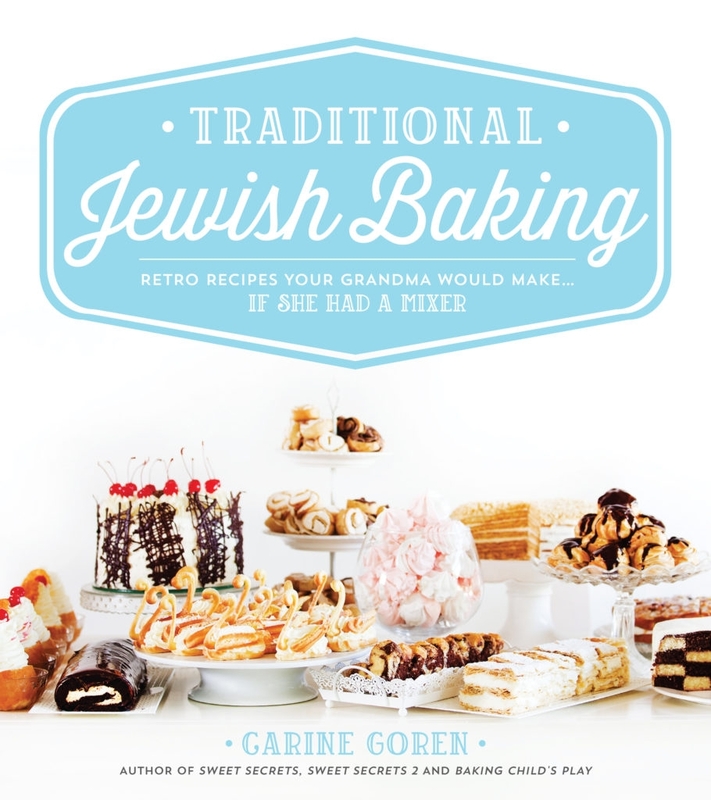 The following story and recipe come from the book Traditional Jewish Baking by Carine Goren. I was never able to pronounce the name of this pastry correctly. Sfenj actually means “sponge,” and these are indeed spongy, springy and full of air bubbles. I learned this recipe from my friend and pastry chef Ruta, and here it is, with a few minor adjustments. 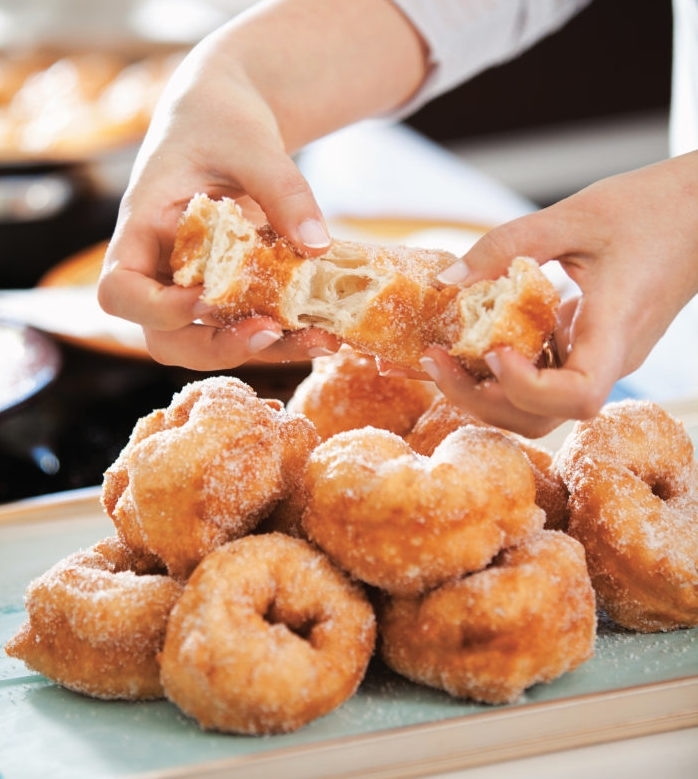 In my family, sfenj are consumed in three different ways: mom likes them plain; most of the family (including yours truly) prefer them sugar-coated; and my own private chef heats up some honey in the microwave oven and dips them between bites. Allow for at least two sfenj per person; I am yet to meet anybody who can stop at one. This recipe was reprinted with permission from Traditional Jewish Baking by Carine Goren, Page Street Publishing Co. 2016. Photo credit: Daniel Lailah. In the largest bowl you have, mix the flour and yeast. Add the sugar and salt, and mix with the flour. Pour in about half the water, and begin kneading with your hands—fingers spread open, using lifting motions from the bottom of the bowl to the surface of the dough. Gradually add (all!) the remaining water, and knead for another minute, and no more! This dough must not be over-kneaded. It is very loose, and that’s okay. Cover in plastic wrap and set aside to rise, until doubled in bulk. With very wet (dripping with water) hands, work the dough to let out the air (it will return to its original volume). Cover, and let rise again until doubled in bulk. This second rising will be a lot shorter, so you may begin heating up your oil. In a wide pot, heat the oil to 325ºF (160ºC) on a deep-frying thermometer. Dip your hands in a bowl of cold oil or water. Pinch a ball of dough (tangerine size) and pull it up. With your other hand, pinch under it to cut it off the rest of the dough. Holding the ball of dough with both hands, insert your finger in its center to create a hole, and stretch until the hole is about 1 inch (3.8cm) in diameter. Carefully place the bagel shape into the hot oil. Repeat with the rest of the dough (not forgetting to dip your hands in cold oil or water occasionally). Deep-fry until sfenj are golden, 2–3 minutes on each side. Put the fried sfenj on a paper towel to soak up the excess oil. Dip each sfenj in a bowl of sugar to coat, and serve immediately. *Grandma Knows Best: Sfenj must be prepared and fried when they are meant to be served. Don’t prepare this dough ahead of time, and don’t put it in the refrigerator. When cold, it is hard to work with, and it goes sour very quickly (within 4 hours).